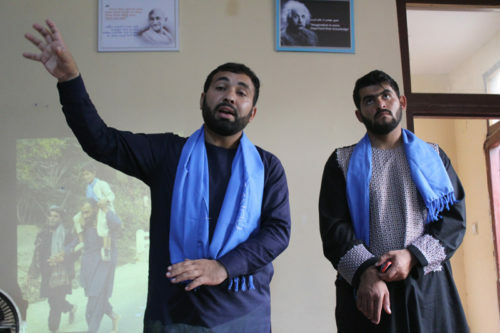 Iqbal and his fellow People’s Peace Movement (PPM) representative, Badshah Khan, had an unusual and delightfully different conversation with the young Afghan participants of the ‘Youth on the Road to Peace Conference’ on the 26th of September 2018, organized by the Afghan Peace Volunteers (APVs) in Kabul. “Many governments and corporations have a thriving weapons business. I feel that this is dangerous because as they seek greater profits, they are threatening not just Afghanistan, but the whole world. We human beings may soon destroy ourselves,” Iqbal Khyber had said to me afterwards. We acquiesce to continued international arms sales because we are comfortable in our pet beliefs and fixed ideas about defeating ‘terrorists’ through superior warfare. Just as we preserve our fossil-fuel habits despite our awareness of climate science, we ignore U.S. congressionally-mandated evidence that the ‘war against terrorism’ has, in fact, increased terrorist attacks five-fold.